Cobweb ghosts are inconvenient - especially grumpy ones with bad breath. Don't they know silence is golden? Johnny Strong is the expert; he hasn't spoken in two years. Not one word to anyone except the ghost. The main purpose of life is to avoid people and being noticed. Friends? He doesn't need them; and certainly nobody wants him despite what the ghost says. Until a new boy appears - Finn Lyons, teenage wizard. He eats frogs, concocts potions, and is always hungry. Not only does Finn stand up for Johnny; he actively seeks his company and soon becomes part of life. First love; family and words; a heady mix to go in the potion but how will it all turn out? Hubble bubble; Johnny Strong's in trouble! Silence is not always golden in this sweet, zany story of the purest magic at Christmas. I've rewritten this review twice already - far many more times than that in my head. I think this happens when something is important to you. Survival mode kicks in and you think...I really shouldn't share this with the rest of the world. It's a bit like when cats bury their poop - not to hide it from predators, but so they don't challenge more dominant cats. I'm not going to share the personal reasons why Nobody's Butterfly is important; what I will say is what other readers have said: I wish there had been stories like this when I was an adolescent. I'll also admit that I cried many tears as I edited, and when I went back and read it again. And I'll read it again. My tears were not because the story is sad or 'angsty'. I despise the use of the word 'angst' in relation to young adults. It makes their problems sound petty and irrelevant when they're not, especially for young adults like Johnny and Finn - the central characters in Nobody's Butterfly. In England alone, there are 17,000 young people like Johnny and Finn. I can't even comprehend that figure. I'd say my tears were 50% desperation (Johnny's - I felt all of it) and 50% relief that something good came out of it. That's the wonder of fiction - the possibility of a happy ending, not only in the story we're reading - Nobody's Butterfly has a wonderful conclusion - but that we can make those happy endings happen for real. And we can. We still need more stories written for young adults - really for young adults. It's not about the age of the characters, nor the omission of explicit content. It's about power and empowerment. Young adult fiction needs to empower young adults and portray the world through their eyes. It takes a great deal of skill to do that as an adult author, no matter that we were all young adults once. Claire Davis and Al Stewart have those skills by the bucket load. Nobody's Butterfly delves into some of the uglier things young people have to deal with, most of which come from adults exercising their power over adolescents and children. That's the way society is set up - those over the age of 18 are automatically responsible for those under the age of 18, and a lot of adults confuse responsibility with power. The trouble is, how do we make them understand? Putting power in young people's hands means not turning a blind eye or assuming we understand, not imposing our own agenda. It's hard, especially for anyone working with young people. Targets, evidence, policies, procedures...the paperwork is worse than pointless; it's counterproductive because it stops us doing our job - to teach, to care. To listen. I can't put into words how much I love this story - for its magic, its wonderful fuzzy happy Christmas-ness, and for how brilliantly it illustrates what can happen when a young adult speaks up and for once someone takes notice. Our responsibility as adults is not always to fix problems, but to stand by, just in case, while young adults fix those problems for themselves. That's empowerment. 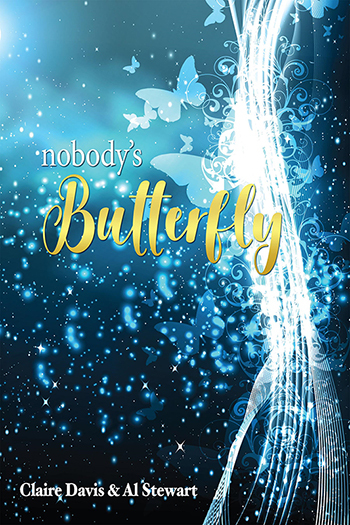 Nobody's Butterfly is a novella by Claire Davis and Al Stewart, released 1st December, 2017.